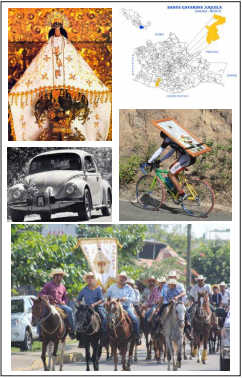 The fiesta of the Virgin of Juquila is one of the most important and with greatest following among the Catholic community of the State of Oaxaca, and even among the faithful of surrounding states like Puebla, Guerrero and Veracruz. The town has a population of 5,579 inhabitants and is at an altitude of 1,462 meters above sea level It is located north of Puerto Escondido on Federal Highway 131. The town of Juquila is known for the Santuario de Juquila which houses a 30 cm statue of the Virgin Mary, which has been venerated since the 16th century. In 1633, it survived, completely intact, a fire that destroyed the village in which it was originally located. At the beginning of the 18th century, it was moved to its current location where the sanctuary was built for it. From all corners of Oaxaca, of the nation and even from countries of Central and South America, countless pilgrims arrive and take part in the fiesta. This celebration, taking place the 8th of December of each year, unites thousands of believers, who make the journey to show their devotion to the image of the Virgin of Juquila. However, because of the enormous influx of the faithful, many people prefer to visit the Virgin on most any other date. For this reason, all throughout the year you are very likely to observe long pilgrimages who, either walking or in all types of vehicles, arrive to renew their faith in the Virgin of Juquila. Many pilgrims buy keepsakes of her image from necklaces to pictures. Pictures are often attached to the front of the car or bicycle or horse, and decorated with flowers for the journey home.